Prepare to be Spell Bound by this incredibly magical slot! Click here to play! Learn how to wield the secret arts and earn yourself some massive cash payouts in the process! 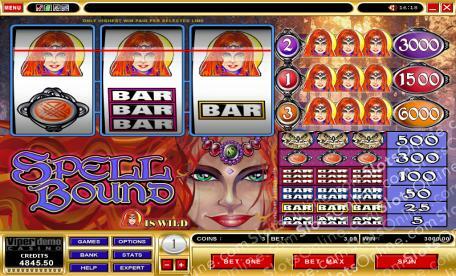 Spell Bound is an ethereal 3-reel slot played across three pay lines, where the more lines opened means that you have a greater chance of winning combinations. The bar symbols pay out whenever three of them appear on the reels, and become more and more lucrative as they double and triple. The Owls can payout up to 500 times your wager, but the Enchantress is by far the best symbol in Spell Bound. She is Wild and can be substituted for any other symbol on the reels in order to complete winning combinations. If you manage to spin up three Enchantresses on the third pay line you will win yourself up to 6000 times your initial stake. Take yourself on a Spell Bound tour at this exciting slot today! The Enchantress is Wild and can be substituted for any other symbol on the reels. Spin up three of her on the third pay line and receive 6000 times your wager.